All aquariums will either be made of glass or acrylic. Glass is usually preferred by experienced aquarists – however, it can have several drawbacks in terms of safety. Glass is heavier and will always be at higher risk of breaking or cracking. It is also usually joined at the edges by silicone which provides less structural security than an acrylic tank. However, it is much cheaper than acrylic and will give you full open access to the opt of the tank. Acrylic tanks, on the other hand, are stronger and lighter as the solvent used to bond the edges of acrylic together provides firmer hold than the silicone bones in glass tanks. However, keep in mind that acrylic tanks scratch easily and they are also not fully accessible at the top – instead, access too the fish and water is usually provided via small holes at the top of the tank; this brings its own potential risks when cleaning and transferring fish. It is essential that an aquarium has a tight-fitting cover or top to prevent the fish from jumping out. It also helps to prevent dangerous items from falling into the tank by accident and discourages any predatory pets (such as cats!) from trying to catch the fish. In addition, it also helps to reduce evaporation and provides a solid surface to anchor the lights. Most tank covers are made of glass, hinged at the centre, with a plastic filler strip that can be cut to fit the filter and other accessories. Alternatively, covers can be a plastic “hood” which matches the trim of the tank. Be careful if you’re doing any work and have to remove the tank cover – do not place it on the floor where you might accidentally step on it and shatter it! These are extremely important for tank security. Considering the weight of water, the base must be carefully chosen to be able to support the weight of the full tank. A range of stands are available, made from wood and wrought iron; the latter is stronger but will rust over time. It is worth investing more in a suitable and sturdy base for your tank as if it collapses, the consequences can be disastrous – both for your fish and for your flooring! It may seem obvious but do not place the tank anywhere near items that may drop on it and smash it! Make sure also that the tank base is standing on an even, flat surface otherwise it may develop stress cracks over time. Avoid placing the tank in a high traffic area, such as a hallway – busy passing bodies can easily bump into the tank and possibly knock it over and if anyone trips and falls onto the tank, not only will it probably break but they may also be badly cut by the broken glass. In addition, it is a good idea to avoid areas of direct sunlight as this could harm the fish. Again, another seemingly obvious point: we all know that water and electricity don’t mix. However, you will inevitably need to use various electrical devices in the set-up of your tank, such as heaters, lights and filters and accidents can easily happen if good routines and sensible precautions are not adhered to. For example, it is a good idea to have a “drip loop” when setting up the wires attached to any electrical equipment – this means that there is a loop in the wire so that is dropped down below the power point and then raised back up – so if any water leaks down the wire, it will drip off the lowest point rather than slide straight into the power point. Other precautions include: make sure that you only use devices specifically made for aquariums, make sure that the device as the electrical safety seal of approval, use a powerboard with a built-in circuit breaker, unplug all wires before tackling any jobs around the tank, do regular inspections of your equipment and don’t be hesitant about discarding faulty items – and if you do need do to any electrical work, make sure that you use a licensed electrician. 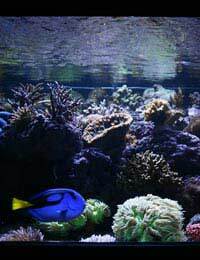 Lastly, the aquarium heaters required for tropical fish can have hazards of their own. These heaters are usually constructed of heating elements and a thermostat, housed in a glass tube. This means that the electricity powering the heater is only separated from the water in the tank by a thin layer of glass. So extra careful when working within the tank not to knock against and damage the heater – if it is cracked or broken, there is a high risk that you and your fish will be electrocuted. Ideally, turn the heater off first and wait about 15 minutes for it to cool, before working in the tank. With a few commonsense precautions, you can relax and enjoy your fish tank knowing that it is safe and secure.